Following Russian President Vladimir Putin’s order, on 5 December at 12.00 o’clock, a Northern Fleet’s ship detachment led by the heavy aircraft-carrying cruiser Admiral of the Soviet Union Fleet Kuznetsov was sent to the World Ocean, namely to the north-eastern part of the Atlantic and Mediterranean. Anatoly Serdyukov, the Russian Minister of Defence, in front of the numerous TV cameras, reported to the Supreme Commander-in-Chief on the order and procedure of the Northern Fleet’s multipurpose aircraft-carrying group entering the sea. He said that the main purpose of this cruise was to provide Russia’s naval presence in the strategically important sectors of the World Ocean and to create favorable conditions for safe Russian navigation. Apart from the Kuznetsov, there are two more anti-submarine ships Admiral Levchenko and Admiral Chabanenko in the shock ship group, along with supply ships Sergey Osipov and Nikolay Chicker. The Baltic Sea Fleet is to assign the supply vessels Lena and Kola. In the Mediterranean Sea they will be joined by a Black Sea Fleet’s detachment formed of missile cruiser Moskva and tanker Ivan Bubnov. In all, four warships, seven auxiliary vessels, 47 airplanes, 14 of which belong to strategic aviation, and ten helicopters will take part in the cruise. This group is expected to conduct three tactical exercises with target practice and dry firing, including joint maneuvers with foreign Navies’ ships. It is planned to call at 11 ports of six countries. By 3 February, 2008, the date of the Russian ships’ scheduled return to the home bases, the ships will have sailed 12 thousand miles. Vice-Admiral Nikolay Maksimov, who was appointed Commander of the Northern Fleet on 20 November, heads the cruise. President Vladimir Putin wished everyone luck and the traditional “sail on an even keel” (according to the Russian marine tradition “Seven feet under the keel”). Naval Headquarters have explained that the Minister’s expression, namely, “providing safe navigation”, should be understood as conduction of tactical exercises on training and mastering the proper tactics on ships and vessels protection against terrorists. Exercises of that kind have already been conducted in the North Atlantic. The crews of Kuznetsov, together with those of Levchenko and Chabanenko, supply vessels as well as over 10 strategic airplanes, which had flown to the ocean from their aerodromes situated on the mainland, took part in those tactical exercises. Fighters Su-33, attack planes Su-25, and anti-ship helicopters K-27 were taking off right from the aircraft carrier’s board. If we take into account the fact that the weather those days was rough: according to the Navy Headquarters, the sea was 5 point high, while wind force was 13-17 m/sec, we can not but admit that the Russian sailors have successfully withstood the first test of the ocean. It was twelve years ago, to be more precise in 1995, that the only Russian aircraft carrier Admiral Kuznetsov sailed the Atlantic and Mediterranean for the last time. And, as the eyewitnesses claim, she had a narrow escape from that cruise. Her steam boilers which were responsible for securing her steady run had developed a serious leak. As a result of this, the heavy aircraft-carrying cruiser had to spend long months in the shipbuilding plant being put to routine maintenance, repair and modification work. It was only occasionally that she was sent to the northern seas for maneuvers; however, she was not even allowed to sail far from the coast. And the fact that the Kuznetsov has now undertaken such a long and challenging cruise in very difficult weather and storm conditions in the North Atlantic in December, provides sufficient evidence to believe that either it is well-prepared for such a cruise or that the country leaders must have some very weighty reasons to put the ship, her on-board aviation and crew to such a serious risk. And we also know that the Kuznetsov does not have long-range radar patrol and observation planes with which, for example, almost all American aircraft carriers are equipped (propeller-driven airplane E-2A) and their functions are performed by planes Ka-27, which, of course, puts us in the position to admit that the crew is going to be faced with plenty of difficulties. Including the necessity to cooperate with NATO ships and airplanes which, no doubt, will not leave the Russian multipurpose strike group’s entering the ocean unnoticed and will keep a watchful eye on the cruise just as they are presently doing with the Russian strategic bombers air patrolling in the Atlantic. Fortunately, in order to help Kuznetsov and her on-board aircraft a long-range radar patrol and observation plane A-50 has flown from the Mainland. However, it happened in the seas that are relatively close to the Russian shores. The former Commander of the Northern Fleet (1992-1999) Admiral Oleg Erofeev in his interview with the Independent Military Review said that he is “very enthusiastic about this cruise. It is wonderful that our ships have started to sail the ocean again. However, I would like to warn its organizers from unnecessary gung-ho attitudes. This cruise must be, first and foremost, supplied with everything required and thoroughly-prepared. I mean both financially and professionally. The duty can all too often be full of surprises and we have to be well-equipped to deal with them”. Admiral Erofeev did not reveal “the price of the cruise”. “It is hard to say how much it will cost nowadays,-he said.-When I was responsible for organizing Kuznetsov’s first cruise, there was absolutely different money as well as fuel and food prices, I must say”. But the former Commander of the Northern Fleet agreed that the price of the matter might be as much as one billion rubles, even more. Foreign sources give practically the same estimates. According to the foreign press, a similar cruise undertaken by American multipurpose aircraft group cruise costs one million US dollars per day. Though, it is difficult to compare the costs since the prices in our countries differ significantly, as well as the “value” of military labour, insurance, medical care, etc. And our question, namely, what on-budget expenditures are going to cover such large-scale maneuvers, is answered by the Ministry of Defence, as usual, as follows: the expenditures allocated for battle training. What is interesting, a former State Duma deputy and a member of the Defence Committee Major General Nikolay Bezborodov told our parliamentary correspondent that the Northern Fleet’ ships Atlantic cruise was not formally specified in the 2007 budget and no sum of money was allotted for that purpose. “The decision was made quite unexpectedly, and the funds were allocated at the expense of some other maneuvers and tactical exercises”. One of the admirals gave us the following opinion: “If this cruise is organized with the purpose of enhancing the public image of some politicians and is poorly-equipped, then it is not worth a brass farthing. Such a slapdash, careless attitude is just inadmissible when it comes to conducting an operation of that kind. And the two aircraft carrier security ships is nothing but a bluff. American multipurpose aircraft carriers group, for example, has, as a rule, seven or eight security ships including heavy cruisers and atomic-powered submarines, both strategic and multipurpose. Moreover, “rattling the saber” in the region where the 2nd and the 6th US fleets consisting of hundred surface ships are deployed is just reckless and not serious”. Anatoly Serdyukov did not specify in front of the cameras whether the Russian multipurpose aircraft carriers group had either strategic or multipurpose atomic-powered submarines. No such information is provided by news agencies either. Our official sources in the Military Department did not comment of this issue. But specialists know that apart from a number of various important tasks which they fulfill multipurpose aircraft carriers groups can be used to cover the regions of strategic missile-carrying submarines deployment. This is one of the main tasks of such surface ships units – to “secure operational stability of strategic missile-carrying submarines units, surface ships groups of sea-based missile-carrying aviation in the areas of their responsibility”. And, apparently, one has to suppose that together with Kuznetsov or round her such atomic-powered submarines can be. 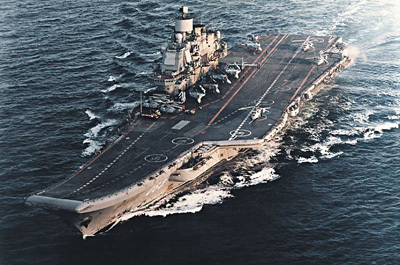 It is difficult to imagine that Russian admirals will not seize such a rare opportunity as the aircraft carrier’ entering the ocean in order to train the coordination of actions of surface and underwater ships as well as fighters of the sea-based aviation and strategic bombers. Not to mention the capacities of space reconnaissance, navigation and intercommunication. The cruise of such a relatively large, for present-day Russian Navy, ships group (by the way, it does not have a single vessel that was built during the recent 15-17 years.- the Independent Military Review) is not only a great risk and responsibility but, to all appearances, a well-thought political propaganda trick. It seems that Russian leaders want to, first, demonstrate the people and the international community the Russian flag in the World Ocean; secondly, provide navigation security (although, unlike the straits of South-East Asia, the Atlantic does not have such problems); thirdly, they are eager to show everybody that the Russian Navy is still alive and capable of efficiently fulfilling various operational tasks. In addition, it also can be considered a winning PR move on the eve of the upcoming presidential elections. And it has been done with the help of the one and only aircraft carrier. As of today, the USN has 11 active assault aircraft carriers. One of them, the George Bush, is being tested before being put into service. The aircraft carrier Gerald Ford is under construction. It is planned to commission two more aircraft carriers by 2023. The USN is expected to have 12 operationally ready aircraft carriers by the year 2020. All the American carriers, with the exception of Kitty Hawk (CV-63) whose removal from service has already been decided by Pentagon, are based in the US naval ports. The Kitty Hawk is stationed in the US naval base in Japan (Yokosuka). She is going to be replaced by the aircraft carrier George H.W. Bush (CVN-77) in the summer of 2008. Aircraft carriers can operate as part of aircraft carriers assault groups which are named according to the names of the aircraft carriers tender ships. One aircraft carrier, one cruiser with on-board guided missiles, two destroyers armed with guided missiles, one frigate with guided missiles, and one training vessel operate as parts of the aircraft carriers assault group. Such combination of ships can ensure high mobility of the group and successful fulfillment of the operational tasks it is charged with. With the purpose of providing anti-submarine defence, the aircraft carriers striking force can be reinforced by aircraft-carrying anti-submarine striking group, the so-called tactical surface ships group meant for enemy submarines destruction. As a rule, this group includes an anti-submarine aircraft carrier, the main objective of which is enemy submarines detection and destruction with the help of on-board anti-submarine planes and helicopters, as well as 6 or 8 destroyers and patrol vessels. All this is done, first and foremost, to protect the aircraft carrier from enemy ships and submarines because she herself is not equipped with any armament. Aircraft carriers assault groups are intended for land-based targets destruction; enemy ships and submarines destruction at sea and at bases; enemy planes and helicopters destruction in the air and at aerodromes; as well as for assisting land troops, securing landing operations and ocean communications protection. Aircraft carriers assault groups are also used to extend the aircraft carrier’s operational scope owing to extra fuel and armaments provided by supply ships. In strict compliance with the Fleet Response Plan, six active USN aircraft carriers assault groups are to be on alert and be ready to deploy at any time within 30 days following the order. Two more assault groups are to be ready within 90 days. The USN carries out a regular rotation of its aircraft carriers assault groups whose active duty period is six months. Aircraft carriers assault groups can deploy in their core zones on order made by the US Armed Forces Command.